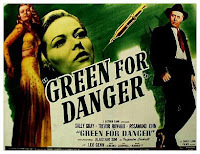 Classic Film and TV Café: Is "Green for Danger" one of the Greatest Detective Films? Is "Green for Danger" one of the Greatest Detective Films? It's a nifty, though misleading, poster. 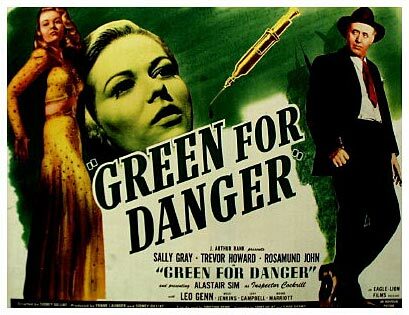 In his book The Detective in Film, William K. Everson touts Green for Danger (1946) as one of the three best detective films ever made (the others being The Maltese Falcon and The Kennel Murder Case). I not only concur, but will add that it may be the best Hitchcock film not made by Hitchcock. That’s a bold statement, I know (and fans of Charade may be aghast), but Green for Danger could easily have been directed by Hitch during his late British period that produced The Lady Vanishes. 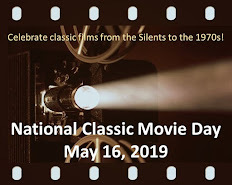 In fact, the two films bare an obvious connection: both were written by the team of Sidney Gilliat and Frank Launder. Gilliat also directed Green for Danger. 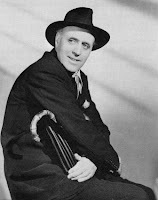 Alastair Sim as Inspector Cockrill. Based on the 1944 novel by Christianna Brand, the film takes place during World War II at an “emergency” hospital in the English countryside. Emotions are running high at the hospital due to the constant air raids and a love triangle with two of the doctors (Trevor Howard and Leo Genn) vying for the affections of one of the nurses (Sally Gray). After another nurse announces that a patient’s accidental death was really murder, she is found dead. 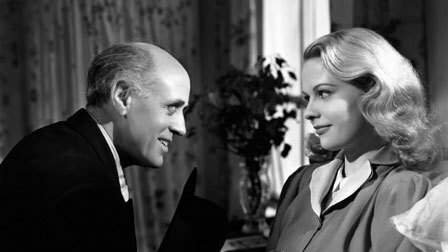 Scotland Yard is summoned and arrives in the form of cinema’s most offbeat detective, Inspector Cockrill (Alastair Sim). Gilliat and Launder make brilliant use of time and place. Random explosions from the German bombs create both tension and humor (in the masterful hands of Sim). Equally atmospheric are the isolated hospital’s shadow-filled rooms, the tight hallways, and the white operating theater. It’s a spooky place, especially in the eerie, brilliantly-lit scene where Sister Bates is killed. People sometimes die in hospitals due to natural causes—so what better place to stage a murder? Dr. White: I do hope everything can be arranged discreetly. Inspector Cockrill: Hmm, shouldn't think so for a moment. Dr. White: Why not? Press? Do they have to be seen? Inspector Cockrill: Can't keep ’em out. Inspector Cockrill: I don't mind. They always give me a good write-up. Cockrill also narrates the film from time to time, which allows him to offer amusing commentary like: “My presence lay over the hospital like a pall…I found it all tremendously enjoyable." Inspector Cockrill nicely interrogates Nurse Linley (Sally Gray). What makes Cockrill so interesting is that he can turn off the flippant humor like a switch and demand an answer to a probing question. It’s a credit to Sim’s acting ability that he pulls this off so effortlessly. It’s also a shame that Sim, Gilliat, and Launder didn’t make any follow-up films featuring Inspector Cockrill. Sim gets excellent support from the actors portraying the suspects, especially Howard and Genn as the rival doctors. They are so convincing that the identity of the murderer is a well-kept secret throughout the film, even though the title provides a vital clue before the credits even roll. Green for Danger was on my want-to-see list for about 15 years. One day I came from work and my wife seemed a little excited. 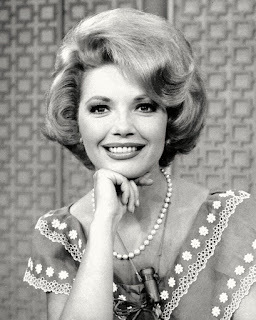 She had made a lovely dinner, served me in front of the TV and VCR, and turned on Green for Danger—which she had taped off USA Network during that day (back when USA showed quality movies!). Sometimes, expectations result in disapppointment, but I’m glad to say that Green for Danger exceeded all expectations and remains a movie that my wife and I continue to show any acquaintances who haven’t seen it. Frank Launder (as in washing). With partner Sidney Gilliat, also did the St. Trinian's comedies (with Alastair Sim in the first one, at least). L&G wanted to keep using Sim, but he didn't want to be tied down to the one character; he did do a brief appearance in the second one. And this is why there was no Cockrill film series; Christianna Brand wrote many stories, long and short, about the character, but Sim turned down the opportunity. Once again, Launder and Gilliat were willing, but Sim just said no. Thanks, Mike. I corrected Frank's name. Indeed. It is the droll humour amongst the crime and its solving that makes Green for Danger such a delight. When thinking about the best, I start with Green for Danger, and everything else is a distant second. Two coincidences: I was discussing this movie with my mother just last week. And not more than ten minutes ago my sister and I were discussing "the best Hitchcock movies he never made". "My presence lay over the hospital like a pall – I found it all tremendously enjoyable." How very coincidental, indeed! I just love that quote. This sounds terrific! I'd love to see Alastair Sim in this role. I bet he's pitch-perfect. It has been years since I have seen "Green for Danger" and I absolutely love it! Cinematic magic with a clever mystery and one of the most intriguing detectives ever. Love Alastair Sim! I definitely have to re-watch Green for Danger. My sister and I were just talking about the film this morning after I told her how much I enjoyed "White Corridors" and I had completely forgotten about the mystery-aspect of the story, only remembering the medical scenes instead.